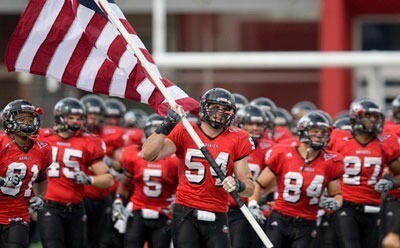 It seems only fitting that Northern Illinois senior defensive end Jake Coffman (German Valley, Ill./Forreston HS), the 27-year-old Marine Corps veteran who elected to return to the Huskie football team in order to play his final season of college football, on Wednesday was named one of 10 finalists for the 2010 Lowe’s Senior CLASS Award. After all, the award – its name is an acronym for Celebrating Loyalty and Achievement for Staying in School – celebrates seniors who have exhibited excellence in character, in the community, in the classroom and in competition, while showing commitment to their universities and their teams by completing their college eligibility. Coffman not only exemplifies excellence in all four attributes, he made a conscious decision to return to Northern Illinois in 2010 specifically to “finish” what he had started as a 22-year-old true freshman in 2006. On the field, Coffman leads the 5-2 Huskies with five tackles for loss and two quarterback sacks this season, but it is his impact off the field as an inspirational leader and role model to his Northern Illinois teammates that has had the greatest effect on the 2010 NIU squad. 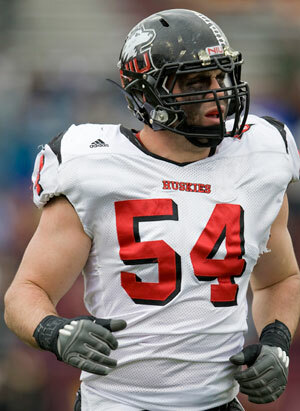 “Jake is our defensive leader and the most inspirational member of our team,” said NIU head coach Jerry Kill. “He served two terms in Iraq and has been through a lot in his life. He stands for everything you want in a young man and in a college football player, on the field, off the field, and in the community. Coffman earned his bachelor’s degree from NIU in sociology in May 2010 and is currently taking post-graduate courses. In the community, he assisted the University Women’s Club in Sycamore’s Treasures from the Attic, a citywide yard sale during the summer of 2010 and has worked with Hope Haven, a shelter for underprivileged families in DeKalb. Coffman has volunteered his time at a local nursing home and with the DeKalb Red Cross and he is also involved with the veteran’s group on campus. During his four years in the military, Coffman served two tours in Iraq. In typical Coffman fashion, the senior shared credit for his status as a finalist for the award with his coaches, teammates and family. The 10 finalists for the Lowe’s Senior CLASS Award were chosen by a media committee from the list of 30 candidates announced in August. Fans can now vote online to help determine the winner. Fan votes will be combined with media and coaches’ votes and Lowe’s will announce the Senior CLASS Award winner Jan. 10, 2011 prior to the Tostitos BCS National Championship game. Coffman and the Northern Illinois Huskies play host to Mid-American Conference foe Central Michigan at Huskie Stadium beginning at 3 p.m. Saturday.